What Are the Best Scooters for Toddlers? Choosing a good scooter for a toddler can be challenging. There are many different scooters with a host of features aimed at children as young as 1 and 2 years old. Will my toddler be able to ride a scooter yet? Why are some toddler scooters a lot more expensive? Is it worth spending a lot of money or are budget scooters just as good? If you need answers we have them. We have detailed everything you need to know about buying a scooter for your toddler. Read on to find out more. Check out some different types and age recommendations on the chart below. Wheels - it almost goes without saying you'll need 3 or 4 wheels as children under 2 won't have the balance for 2 wheels. Wheel Material - Generally wheels on scooters for toddlers tend to be either plastic/PVC wheels or polyurethane (also described as PU) wheels. Plastic / PVC wheels can be durable but they often don't offer a very smooth ride. Scooters that have PU wheels tend to offer a smoother ride so this is the material to look out for. Wheels size: Wheels on scooters for toddlers and 2 year olds also tend to be slightly bigger than standard size as this makes the scooter easier to control. Standard size scooters have wheels of around 100mm whereas wheels of 110 to 125mm are common on toddler scooters. Larger wheels are also better for cruising along the pavements as they go over bumps and cracks more easily offering a smoother and quicker ride. Lightweight - a lightweight scooter is a must. Young children will need to be able to pick up and move the scooter when they first get on it. This is how they will move the scooter to change directions at first. Little kids also learn to manoeuvre the scooter by picking it up. A lighter scooter will be easier for them to control when cruising too. Additionally, when your toddler or 2 year old gets tired at the park or playground, it'll be you who will have to carry it home or back to the car. Foldable - a scooter that folds is normally easier to carry and to store as well. Although some foldable scooters can be heavier due to the extra weight of the folding mechanism. Other scooters aren't foldable but the t-bar can be removed from the stem for easy storage in the boot or a cupboard. Balance, Safety and Stability - many scooters have some great factors to help balance, safety and stability. For example, a low, wide deck tends to be easier to get on and off and helps with balance. Features to Grow with Your Child - young children grow, develop and change at a quick rate. To get the most out of your scooter, its good to look for features which will grow with your child. These can include height adjustable handlebars. The mini micro scooter even has 3 different stages making the scooter suitable for toddlers between ages 1 and 3. Handlebar height - ideally the handlebars should come up to around waist height on your toddler. If the handlebars are waist height they will find the scooter easier to control. 1.) The parental handlebar gives full control of the bike to push your little one around while he or she sits on the seat and use a footrest. 2.) The second step allows your child to push themselves along with their feet while sitting down, remove the footrest as they gain confidence. 3.) Once they are able to push themselves around remove the handlebar for stage three. 4.) The fourth assembled stage transforms the bike into a scooter for beginners by removing the seat. 5.) Adjust the T-bar height for stage five as your child grows. Weight is 2.5kg when used as a stand alone scooter. It's quite light but there are lighter scooters such as the mini micro. Steering is lean to steer. It features a button to turn off the steering while kids are learning. This means they don't have to worry about turning until they've mastered scooting in a straight line. This is a unique feature to the globber. Removable t-bar - the scooter can't be folded but you can remove the t-bar for easy storage in the boot or at home. Handlebar height - The height of the obar handle is 43cm - this is from the deck to the top of the handlebar (the measurement from the floor to the top of the handlebar is 49cm) The tbar handle is 61cm (67cm from the floor to the top of the handlebars) so it really does grow with your child. Ideally the handlebar height should come to about waist height on your toddler so this should help you decide when buying. Wheels - The mini micros have polyurethane wheels which offer a really smooth ride. The mini micro deluxe is designed for kids from aged 2. It accomodates children who measure between 80cm to 110cm. The micro is known for it's award winning design and engineering. It's a scooter that is built to last. This version of the scooter had an adjustable handlebar which has a lowest height setting of 49cm. This low handlebar makes it an excellent choice for toddlers. Ideally the handlebar on a scooter should be around waist height. If the handlebar is too high it makes it much more difficult to control. This makes it a fab choice for the youngest of children. The maximum height of the handebar is 69cm so the scooter will grow with your child and give them the perfect handlebar height at every stage making scootering much easier. Even though the mini micro deluxe has a folding mechanism, the scooter is still extremely lightweight at just 1.8kg. A lightweight scooter is much easier for toddlers to maneouver. They can lift it up and the kerb and move it around with ease. Young kids quite often pick up their scooters to change direction when they're learning to scoot so a lightweight option aids with this too. Removable handlebar - the handlebar can be removed for easy storage. This is the classic version of the mini micro scooter which has been around for many years now. The quality of the scooter is evidenced by the fact that it has stood the test of time. Handlebar The difference between the classic and the deluxe is that the classic does not have a height adjustable handlebar. The handlebar measures 66cm from the floor to the top of the handlebars. The advantage of not having a height adjustable mechanism is that the mini micro classic is a lot lighter than any other scooter on the market. It weighs just 1.5kg so it really is easy for very young kids to control lift over steps, doorways and negotiate pavements. Age Recommendation It's aimed for kids aged 3 and upwards but children younger children do use this scooter. It will very much depend on the height and the ability of your child. Wheels It has polyurethane wheels, offers a very smooth ride. Check out a personal review as this is my youngest son's scooter, a guide to 3 wheel scooters for 1 to 5. ​The 3style scooter is another possibilty of 3 wheel scooter and boasts some outstanding features. It's excellent value for money. It is significantly less expensive than the mini micro and is a similar price to the Vokul featured above. Handlebar: The handlebar can be adjusted from 52cm to 78cm so will easily adapt to your child's height as he or she gets taller. 52cm is only a few cm more than the handlebar on the mini micro deluxe (which is 49cm) so it's a great alternative and worth considering for very young children. In comparison, the mini micro classic has a fixed handlebar of approximately 66cm. Foldable: It can also be folded which is great when toddlers are tired. A folding scooter can be easily transported by being carried if needed. It takes up less space to store when not in use. It's also easy to put in your car or carry on top of a stroller or buggy. Weight: It is lightweight. However, this is still heavier than the mini micro classic and mini mirco deluxe which are only 1.5kg and 1.8kg respectively. The additional weight on the 3style is due to the weight of the adjustable handlebar and folding mechanism. Lighter scooters are easier for very young children to manoeuvre and control so this may be something to bear in mind when deciding which scooter is best for your child. However, it is still very light compared to some other alternatives. Wheels: The wheels 120mm and are made of polyurethane. It comes in several different colors. The wheels also light up for extra fun! The iscoot whizz is another option 3 wheel scooter. The iscoot brand has been around in the UK for many years now and has proved to be a popular brand of scooter. The iscoot whizz is aimed at younger children in the 2 to 5 year age range and is at a similar price point to the 3style scooters. The lowest handlebar height is 55cm which is highter than the 3style scooter and the mini micro so may factor in your decision of which scooter to buy. It will be fine for bigger toddlers but smaller toddlers may do better on scooter with a lower handlebar height. It has 3 different handlebar settings. The highest is 69cm which is the same as the mini micro. The iscoot has lean to steer scooting like most 3 wheel scooters. It weighs 2.4kg which compares with 1.8kg for the mini micro deluxe. The whole handle and stalk can be removed easily with a push of a button if you need to store or transport the scooter. The wheels are made of polyurethane and offer a smooth ride. Another alternative to the mini micro is the Globber Primo scooter which is currently a very popular brand of scooter in the US. 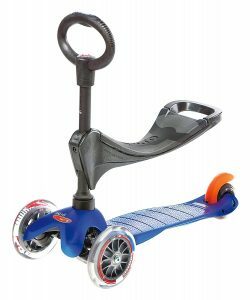 This has 3 wheels with two at the front and a one shock absorbing wheel at the back. The Globber also has lean to steer steering. What's different about this scooter is there is a button where you can lock off the steering. This means they can learn to scoot in a straight line before they have to worry about turning. The lowest handlebar height is 67.31cm which is lower than the handlebar on the mini micro classic. It can be to 3 different heights with the max being 78.7cm. This does make it better for older toddlers who are approaching age 3. The deck is low to the ground, making it easy for little ones to get on and off. It weighs 2.5kg which isn't he lightest but will be fine for bigger children approaching age 3. Which scooter? Not sure whether to get the Globber or the Mini Micro? Compare both scooters here. The Zoom Cruzer is another 3 wheel possibility. This is a great option of scooter for older / bigger toddlers if you are on a budget. It's designed for 3 to 6 year olds there are reviews of younger children using this scooter over on amazon. Weight: It is heavier than the mini micro and other 3 wheel scooters. However as the zoom cruzer is cheaper than the other scooters it may be worth compromising on this feature. It may also depend on your child. Bigger and stronger children will find it easier to move a slightly heavier scooter. Deck: The strong re-inforced extra grip footplate is something the mini micro doesn't have and is great for safety and stability. It also features a chunky rear foot brake. Wheels: The wheels are PU. The two front wheels are 120mm in size and the back is 100mm. The extra wide rear wheel is 4.5cm which give extra stability to young riders. For more information, check out a comparison of the mini micro scooter vs zoom cruzer scooter. If you're looking for a budget option of a three wheel scooter, the trail twist scooter which is a great deal for under £20. It's a lean and steer scooter which has some good features including polyurethane wheels which will contribute to a smooth ride over those bumps in the pavement. It also has a large deck and fun despicable me graphics. Like the other options featured it has a lean and steer system. So to go left, lean left and to go right, lean right. It weighs just under 2.3kg which is still lightweight but is heavier than the top of the range micro scooter. Bear in mind that it is aimed at 3 to 5 year olds and the height of the handlebar is 68cm so is going to be better for slightly taller toddlers. It's approximately 2cm bigger than the handlebar height on the standard mini micro. 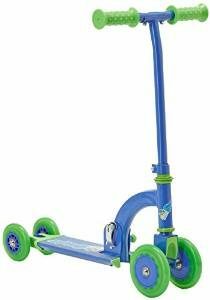 There are reviews of kids about 2 1/2 using this scooter. The scooter isn't foldable or height adjustable. There is a lot to like about the Ozbozz scooter. Firstly its another great option if you're on a budget. There is a blue and green option and a pink and yellow version too.It has 4 wheels which changes to 3 wheels and then down to 2. This is great to grow with your child. The 4 wheels give young children lots of confidence and stability. The wheels are PU so should give a smoother ride than plastic ones. The specs show it's weight is 1.6kg which is very lightweight - compared to 1.5kg on the mini micro. So it should be easy for younger children to use and control. The deck is quite small but this should be fine for smaller children aged 2 to 4 which is the age range it's designed for. The handlebar height is 67cm which is the same or similar to most of the scooters on this page. There are bright colours on this option and the foam covered handles which are easy grip for small hands. The scooter comes in either blue and green or yellow and pink. It also comes with a small tool kit for easy assembly. It's difficult to go wrong with this one if you want a low priced option for a very young child. There are lots of character scooters which will appeal to toddlers, 2 year olds and other small children. These scooters tend to have one wheel at the front and 2 at the back. The scooters are designed to be sturdy, robust and safe which is great for peace of mind and can be great to introduce very young children to a scooter. However, they won't pick up a lot of speed. They may also be difficult to steer and manoeuvre. On the plus side they tend to be inexpensive. They will really appeal to toddlers if they like the characters too. Frozen and spiderman seem to be popular at the moment. They will appeal to parents who are looking for something sturdy and safe for their little one. The Frozen scooter featured has an adjustable handlebar so can accommodate children of different heights. It is a tri wheel design with two wheels at the rear and a wheel on the front. It also has a robust frame. Like most character scooters of this nature the design, such as the large wheels and the way they are set out, means this scooter is stable and safe. However, it may be difficult to pick up a good speed like you can on the mini micro for example which can be frustrating for some children, but will suit others. If you are looking for a tall toddler you want to look for one with 3 wheels which has a taller handlebar. Ideally you want the handlebar to be around waist height on any child as at this height it is easier for them to control. 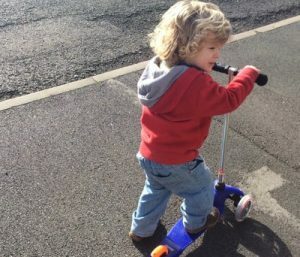 For this reason it can actually be easier to find a scooter for a taller toddler as most first scooters are aimed at 3 year olds who are naturally a bit taller. Many of these have handlebars around 66cm. Another really good thing to look for is an adjustable handlebar. This 3 style scooter has a handlebar which has 4 height settings 52cm and moving to 70cm, 74cm & all the way up to 78cm so this is a great option. Read reviews and check it out here. If you are looking for a small toddler, again the most important thing you need to look for is a handlebar that isn't too high. If you think about it, a handlebar which is too high will be more difficult for anybody to use. Look for a handlebar that sits just above the hips. There are a couple of options to choose from. Firstly, there is the 3 style scooter which has a height adjustable handlebar with the lowest setting being 52cm. If you are willing to spend a little bit more another great option is the mini micro which comes with a seat and an obar. The obar is a smaller handlebar for the smaller child which measures 49cm from the floor to the top of the handlebar. This, of course, will accommodate the smallest of children who are old enough to ride on a scooter. If you're looking for a 1 year old, it can be a good idea to look for a scooter with a seat. They can then use it as a ride on at first. As they get older these scooters can convert into a scooter with a handlebar so they can use it to kick along the pavement when they are ready. My recommendation would always be the mini micro 3 in 1 with seat, obar and tbar handle. This really does grow with your toddler. The scooter is well constructed and built to last. Kids use it and pass it onto siblings or it can be sold on ebay after being used. Safey is a top concern for most parents and carers and a helmet is a must. You will be surprised at how quickly a toddler can learn to get up speed up. If you are looking for a helmet, pick one which is lightweight and which fits correctly. You will need to measure around the childs head above the ears and this will give you the circumference you need in cm so you can pick the right size helmet. For heads measuring 44cm to 50cm, check out the smallest boys helmet and the smallest girls helmet. For toddlers who will need the next size up, look for a helmet which will fit heads from 48cm to 52cm. The best budget for you will depend on what you want to spend. Like most things you do get the quality based on your money. There are lots options that are £20 and under. However, you will compromise on something. It will depend on the specific scooter what that is. Lots of scooters of this price will be good for about a year, and then they often start to fall apart in some way or get rattly. The Obozz scooter is one of the cheapest available but pay just a bit more and the 3style scooter is a better choice. If you want the best of the best, you can't go wrong with the mini micro deluxe. You will pay a bit more but it will last, it gives a very smooth ride (no rattling here), it's very lightweight so extremely easy for a toddler to pick up and manage. It also has a high resale value on ebay. It's difficult to go wrong. A foldable option can be very handy for carrying when your toddler has had enough or hanging on the back of a pushchair. Sometimes a foldable option can weigh a little bit more as the mechanism which folds the scooter does add weight, so this is something to bear in mind. A lighter scooter is easier for very young kids to control and move. It can often be worth hunting around to find the best price for the scooter that you want. This is especially true if you're paying for one that is a little more expensive. Checking out prices online is often the best way to get a good deal. Here are some good links to try. Ebay is another great online store to try. It's good to check out the resale value of your chosen scooter. You can also pick up some amazing second hand deals online. The mini micro is always a good one to see if you can get a good second hand deal. As all parts on the mini micro are replacable even if the wheels or another part becomes worn you can easily change it for the fraction of the price of selling a new one. Check out some really great deals on secondhand mini micros on ebay. Many sellers will post out to your or you can pick up a local bargain.